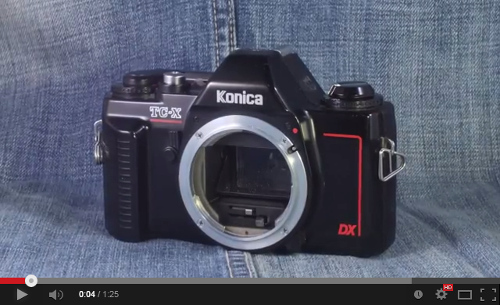 Made between 1985 to 1987 and was the last SLR model under the Konica brand. It was however made by Cosina and not Konica themselves. Also one of the first SLR made that have a body and frame completely made of plastic. Left side has the light meter info and shows apertures from f/1.4 to f/22. A needle shows which will be used in auto. Or which aperture is recommended in manual. Body is all plastic except for the lens mount and the tripod socket which are metal. I find it a bit dull looking. It feels however very cheap and toy like. Shutter and mirror sounds are a little bit to the noisy side but nothing to bad. It is a simple and easy to use camera. Lacks some of the longer shutter speeds but a person that mostly uses the camera handheld will probably not miss that. It support Konica's auto aperture lenses. You can lock the light meter on a value by half pressing the shutter button. This makes it very fast and easy to use. The camera feels good in your hands and buttons and levers are well placed. 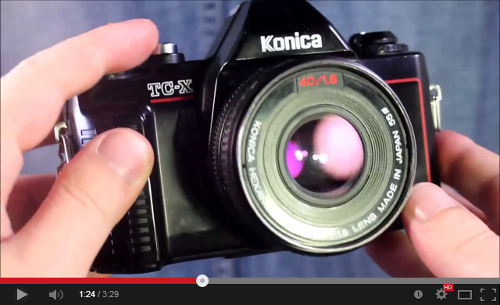 If you're looking for a very light and small Konica camera. Don't mind a very cheap and toy like feel, then this might be something for you. It got the basic things one might need except for longer shutter speeds. And it is the lightest SLR I have tested so far with its 380g. Using this with the Konica Hexanon AR 40mm f/1.8 makes a total weight of 525g which is lighter than many SLR's without a lens. These cameras are also often dirt cheap today.